The chemical process that stops old photographic negatives from fading has been adapted to do much the same for people, a cosmetics manufacturer claims. 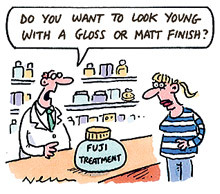 With digital cameras killing off traditional photographic film, the Japanese company Fujifilm has partly reinvented itself as a supplier of anti-ageing treatments that are due to be launched in Britain next month. The transition comes as its rival, Kodak, files for bankruptcy protection in the United States. Fujifilm has used its expertise with collagen and antioxidants — used to fix emulsion to film and prevent the image from fading — to produce a compound that protects skin from the harmful effects of the sun’s ultraviolet rays. According to Fujifilm, its Astalift range of products helps to retain moisture in the skin while reducing the ageing effects of sunlight. Researchers were able to develop nanoparticles of collagen, the protein responsible for skin strength, which can penetrate various levels of skin and so boost plumpness on the surface. The researchers also reduced an antioxidant called astaxanthin — a pink pigment found in shellfish and salmon — to particles measuring only a few microns across for use in Fujifilm’s Aquarysta anti-ageing treatment. A micron is equal to one millionth of a metre and antioxidants are nutrients and proteins inside the body that help to prevent and repair damage to tissue. Scientists from research groups in Europe, America and Asia have recognised astaxanthin as more effective at reducing the damage caused by ultraviolet rays than CoQ10, the antioxidant co-enzyme that is commonly used in anti-ageing treatments. Aquarysta is a red jelly costing £70 a pot that was launched in Japan in 2007 and has since been launched in China. Trade magazine publicity claims it has captured 10% of Japan’s skincare products market. “Collagen only started being used by the cosmetics industry relatively recently,” said Andrzej Brylak, director of Fujifilm’s European beauty and health division. The skincare market in Britain is estimated to be worth almost £1 billion a year, offering Fujifilm a potentially lucrative new opportunity. Rachel Watson, a senior lecturer in aesthetic dermatology at Manchester University, said: “Proving this Astalift product has a benefit will be the key issue.